At the beginning of the ceremony, the question was asked: "What do you ask for your children?" And you all said: "Faith". You ask the Church for faith for your children, and today they will receive the Holy Spirit, and the gift of faith each in their own heart, in their own soul. But this faith must then develop, it must grow. Yes, someone can tell me: "Yes, yes, they must study it ...". Yes, when they go to catechism they will study faith well, they will learn catechesis. But before being studied, faith must be transmitted, and this is a job that is up to you. It is a task that you receive today: to transmit the faith, the transmission of faith. And this is done at home. Because faith must always be transmitted "in dialect": the dialect of the family, the dialect of the house, in the atmosphere of the home. This is your task: to transmit faith by example, by words, by teaching to make the sign of the Cross. This is important. See, there are children who can not make the sign of the Cross. "Make the sign of the Cross": and do something like that, that you do not understand what it is. First of all, teach them this. But the important thing is to transmit the faith with your life of faith: they see the love of the spouses, who see the peace of the house, who see that Jesus is there. And I would like an advice - sorry, but I recommend this -: never fight in front of children, never. It is normal for spouses to quarrel, it is normal. The opposite would be strange. Do it, but that they do not hear, that they do not see. You do not know the anguish a child receives when he sees his parents quarreling. This, I dare, is a piece of advice that will help you pass on the faith. Is it bad to argue? Not always, but it's normal, it's normal. But that children do not see, do not feel, for anguish. 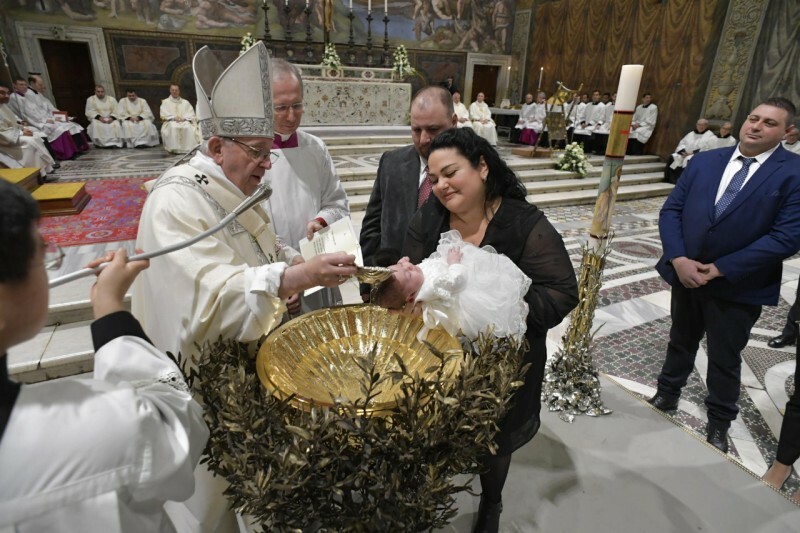 And now we will continue the ceremony of baptism, but have this in mind: your task is to pass on their faith. Pass it on at home because faith is learned there; then one studies in catechesis, but at home [one receives] faith. And before continuing I would like to tell you something else: you know that children feel today in an environment that is strange: a bit 'too hot, they are covered ... And feel the sultry air ... Then they cry because they are hungry, they are hungry . And a third reason for crying is "preventive cry". A strange thing: they do not know what will happen, and they think: "I cry first, then we'll see ...". It is a defense. I tell you: that they are comfortable. Be careful not to cover them too much. And if they cry for hunger, breast-feed them. To the mothers, I say: Breastfeed the children, calm, the Lord wants this. Why, where is the danger ?, that they also have a polyphonic vocation: one begins to cry one, and the other makes the counterpoint, and then the other, and in the end is a chorus of tears! And so we go forward in this ceremony, in peace, with the awareness that it is your turn to transmit the faith.